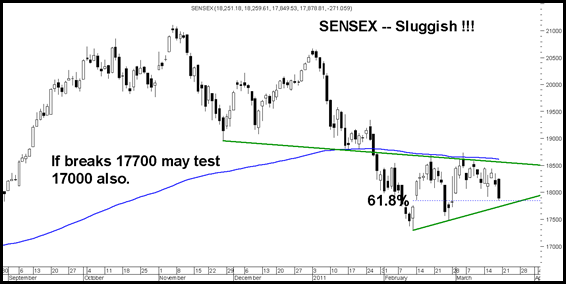 Sensex = Sluggish – Patience will be tested to the hilt. - >The daily moves continue to remain one day up one day down. and sluggish in the range of 18000-18700. - > Yesterday this range was broken and now it is testing the trendline at 17700-17750. - > Sustaining below 17700 would be a weak signal and may head to 17000 levels also. - > It continues to remain a consolidation phase which is more time wise then price wise. - > The fibonacci retracements are now placed at 17670/17840 roughly. - > The downtrend in short to medium term remains till market doesnt make higher top higher bottoms. - > The basic possibilities remain the same. ----------- > Sensex if holds above the 17000-17300 one may expect a bounce back to 38/50% of the last fall which could be 19000-19400 also. ------------> Falling below 17300-17000 ( first signal on break below 17700 ) will open up to 16100/16800 roughly which could be an interesting entry point. With everything around the world in issues the market participants are bound to be uncertain about money allocations. Is the market good or bad ? NO the market is dead 🙂 with no conviction. Volumes have come down on the broader market which are signs of lower activity and interest. March end could see some speculative move up in Midcap/Smallcap Stocks momentarily. Price wise the correction doesnt seem to have more steam then 5-10% from current levels even in a bad case ( say 16-16.5k) whereas the concerns remain timewise that till how much time market stays around current levels. Continue to be patient and make a list of stocks you would like to buy. Research should be given priority as the whole market seems pretty interesting with half the gamut of stocks way below 2007 levels and closer to 12-15k. Buying is very simple at two clicks and bang the whole money can be allocated ! but selling takes a lot of time :). So we may now prefer researching and keeping the high cash or just wait out the current consolidation if you are already invested. PSL seems to be moving up now..What do you suggest. What about EDL & MIRC? I am regular reader of your blog. I have investment in subex, Jp infratech, Uflex, Shashun Pharma and punj Lyod at higher level. Amongst all the scrip which one i can add at lower levels. My investment horizon is two to three year.